According to the Census Bureau, the United States has one of the lowest voter turnout rates in the developed world. Data shows that Americans do not vote for a number of different reasons: 28 percent of Americans say that they are “too busy”; 16 percent say that they do not care; and the rest of the voters either forgot or have another excuse, like inconvenient polling places and bad weather. However, while xenophobic comments have mobilized Muslims and Latinos to get out the vote, many Americans are still not convinced that voting matters. With only a few hours left until the end of the voter registration period for the New York State Primary, I am going to tell you why I will never be too busy, too bored, or too sick to vote. I am voting because I live in a country that structurally disenfranchises its citizens based on race, gender, sexual orientation, and socioeconomic status. I am voting because I live in a country that spends more money on war than they spend on education. I am voting because I live in a country that focuses on fear-mongering instead of empowerment. I am voting because I live in a country that does not protect the men and women who risk their lives in wars to protect us by letting them live on the streets. I am voting because I live in a country that passes laws, like the Fair Labor Standards Act of 2009, that structurally disenfranchise disabled workers by allowing companies to pay them less than the federal minimum wage. I am voting because I live in a country where the ability to achieve the American Dream is largely based on my race, gender, sexuality, and socioeconomic status — as opposed to the positive contributions I can make. I am voting because I live in a country where politicians talk about “protecting liberty,” while justifying the use of government surveillance. 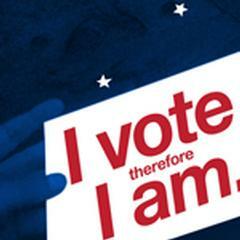 I am voting because I live in a country where it is easier for corporations to vote than it is for people. I am voting because I live in a country where politicians want to use terrorism to fight the very terrorism that they are fighting. I am voting because I live in a country that emphasizes in the “American Dream,” but does not give its citizens the equal opportunity to achieve it. I am voting because I live in a country where the government allows insurance companies to deny its patients the very medications that they need to function, even though it costs them more to pay for Unemployment Insurance than it would cost them to pay for the medication. I am voting because I live in a country where the public listens a clairvoyant rodent more than they listen to scientific research on climate change. I am voting because I live in a country that paradoxically prides itself on diversity, while undertaking measures to homogenize its people. I am voting because I live in a country where 1 in 5 children go to bed hungry. I am voting because I live in a country that spends more money on national defense than they spend taking care of the people that defend this nation when they come home from war. I am voting because I live in a country where we always hear that “children are the future,” but very little is done to help them get the education they need to build a better future. I am voting because I live in a country that has more regulations on the uterus than they have on gun ownership, even though more people die from gun violence than abortions. I am voting because I am afraid of the world I will live in if I don’t. I am voting because, in spite of everything, I still love my country, and I believe that it can get better.